All 60 standard rooms are fully air – conditioned, each providing, private bathroom with shower, switch on / off radio, self – dialling – phone and TV satellite. 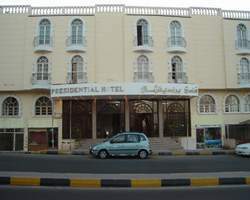 Presidential Hotel has an excellent restaurant within the hotel that serves a buffet breakfast in the morning as well as other meals throughout the day. Whatever your pleasure, Presidential Hotel friendly restaurant, coffee shop, staff are always ready to satisfy all your needs. Presidential Hotel guests also have the opportunity to avail of the swimming pool.